I’ve always felt July to be the longest month of the year. 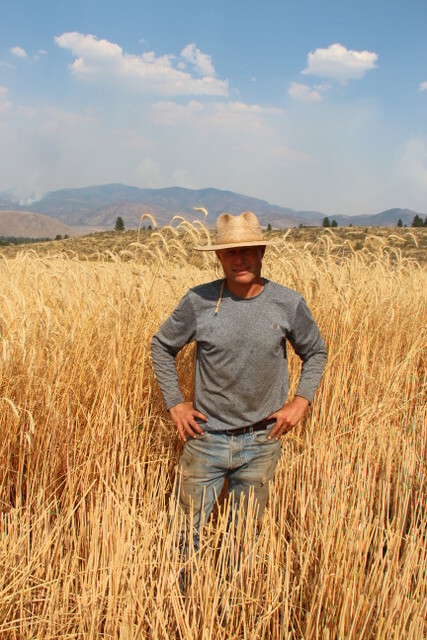 As this stretched-out month comes to close it is safe to say we were “full up” with July here in the Methow this year. Rain, wind , hail, scorching sun, a 38 degree morning, and true firestorms all about our foothills; this year our July had it all. Still, the birds sang. Adult robins and flycatchers and bluebirds began teaching beautiful voice to their young. To me, before sunrise and after sundown is what July is all about, yet even mid-day I’d hear the cheery thrush or quail in the wood. Over 250,000 acres have burned up in our valley this month. Countless wildlife have been incinerated, scores and scores of neighbors have lost homes and property, the 100 degree days roll on and still birds sing. Thank goodness. What simple, reassuring power in the Lark’s song. How precious our running waters. How deep and solid our community. The Bluebird family weathered July far better than some. 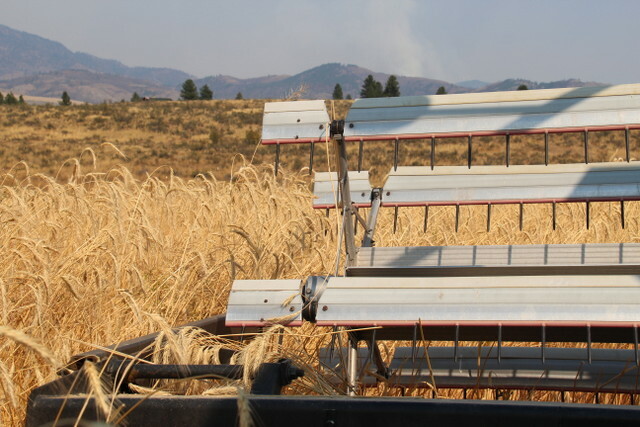 Our fields of wild grain took some hail and heavy wind and rain, but they, too, appear to have weathered the storm with mild damage, though only harvest will tell the true story. Haven been blasted before by heavy thunderstorms, and hail, I’ve marveled at how the physiological character of the ancient grains has the rugged make up to handle more adversity. The shiny husk, long awns then droopy heads when cured, all add up to more resilience which makes some sense: Wild, to handle the wild. Good news also was the fact that we’d just finished our last nutrient applications before the storms. This, too, may have helped the plants. One of the inconveniences of losing power for 8 days was that our irrigation cycle was interrupted. Here again, we were close to the end of the cycle anyway. Things could have been far, far worse. Up here at the granary, freight lines were cut off for a few days. Combined with the loss of power, our usual flow and timely service was interrupted. We thank all for your concerns and patience. We rented a big generator to get going about half-way through the outage, and that was helpful to be sure. The local REA really are to be commended, as power was restored very quickly in sight of the devastation. Of course, the tractors could keep running! Really, we’ve just been turning under cover crop and not much more for field work. Meanwhil e, I harvested our winter rye yesterday! The hail had already harvested some, but we got the Gleaner combine rolling in good shape and cut the 8 foot tall rye. In that sense, this years harvest has begun! That said, we are headed on our annual pilgrimage to New Hampshire for some much anticipated R&R and to visit my homeland with the good fortune of knowing Bluebird is in the assuring hands of our great employees. Very fortunate we are. Our Labs will likely get more swimming in with our house sitter than they did with us! Our thoughts go out to all our neighbors enduring such losses. We hope that Mother Nature can somehow heal what she may have taken away. I hope this finds all able to get some rest, and I hope that August brings a little more summer stability Get in a hike, bike, fish, and swim! Next notes, I’ll hopefully have some harvest reports.